Armando Diaz tries to ignore his scene partner, Christina Gausas, as she yells at him from across the stage. Instead he sits in his mimed car, a boyfriend eager to avoid discussing their relationship. Gausas, the stubborn girlfriend, blocks their make-believe garage door. Diaz’ response is to rev his “engine”. Undeterred, Gausas stands her ground. Diaz simply shakes his head, honking his horn instead. He hasn’t said a word the entire scene – a character pattern he appears reluctant to break. This isn’t far from the real Diaz. Since he first started improvising, Armando Diaz has worked with many illustrious names in the comedy world, not to mention had a style of long-form improvisation named after him. Now the co-owner of the Magnet Theatre and Training Centre in Chelsea, Diaz still chooses to remain out of the spotlight, instead focusing on doing the work he loves so much – teaching improvisation and sketch comedy. A native of Chicago, Diaz was twenty when he first began improvising. At the time, long form improvisation was still an emerging form and there was no training centers or classes like there are today. The only theatre that taught improvisation was Second City in Chicago, which has since produced several famous comedians including Stephen Colbert, Steve Carrell and Amy Sedaris. However the lack of training centres did nothing to hamper the art form. Fledgling schools began springing up all over the city, run out of whatever space was available at the time. Diaz began taking classes at improv Olympic (iO) around the same time Del Close, a name synonymous with the origins of long-form improvisation, began teaching there. As someone who’d been improvising longer than anyone at the time, Close was always attempting working to develop the form further. A pioneer of a long-form improvisation style known as the ‘Harold’, Close is mostly known for producing many students who went on to become not only Saturday Night Live alumni, but some of the leading names in comedy as well. Tina Fey, Amy Poehler and Mike Myers all studied under him at some point in their careers. When Diaz started taking classes at iO, there were only three levels of classes: Level 1, Level 2 and ‘Del’s Class’. Once improvisers had completed all the levels, they would keep retaking Close’s class. It was through iO that Diaz met Adam McKay and Dave Koechner, two of the people responsible for the creation of the show named after Diaz, ‘The Armando Diaz Experience and Hootenanny’. The show incorporates a monologist who tells personal stories that provides the inspiration for the resulting scenes. But at the time, neither McKay nor Dave Koechner knew what the show was about. All they had was the title. Diaz had the idea to tell stories as a part of the show. He’d done something similar earlier, improvising and telling stories, a combination that seemed to work. “I guess because my name was slapped on it, I had to be the first monologist,” reasons Diaz. Now the longest running show at the improv Olympic (iO) theatre in Chicago, it is considered one of the benchmarks of improvisational comedy. Say the word ‘Armando’ and most improvisers will know what you’re talking about. The success of the show resulted in a popular style of long-form improvisation that is performed all over the country. The risk paid off as Diaz’s reputation as a teacher grew. Soon, the Upright Citizens Brigade (UCB), a sketch and improv group Amy Poehler belonged to at the time, asked Diaz to teach a workshop in New York. When UCB received their own television show on Comedy Central, Diaz was hired to be their head writer. It was at a time when the group was not getting long. By the end of the first season of the first season, Diaz was not only working on the show, but also teaching almost half the classes at the training center as well as running theater improv teams and directing shows. Diaz began to teach sketch and improv classes independently, all the while looking for space he could teach out of. Eventually, he did find a space and showed it to fellow UCB staff writer Ali Farahnakian. 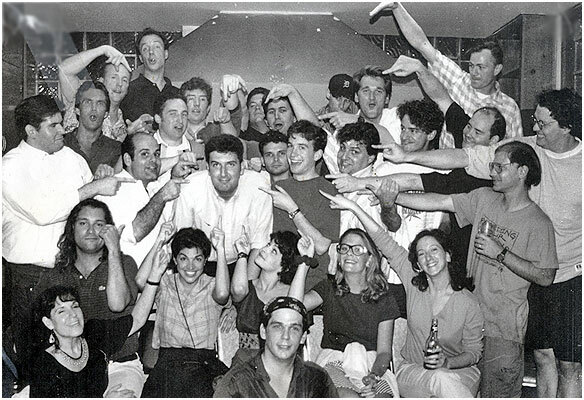 Together, they started the People’s Improv Theatre (PIT) in Murray Hill. But the creation of a new theater led to rivalry between UCB and the PIT. Diaz however did not want to get in the middle of it. “I was not in this to get into a fight,” said Diaz. “So I thought I’d just teach classes and people out there could come find me.” So almost a year after helping start the PIT, Diaz left to become an independent teacher. What followed next were a touch couple of years. “As much as I had a really good reputation as a teacher it was hard to attract students because I didn’t have a theater,” said Diaz. He began to rent space out of the Gene Frankel Theater where he would teach classes that had end-of-class shows attached to them. But over time he kept having ideas for a new theater. The Magnet Theater was born out of this conviction. But this time around, Diaz wanted to ensure everything went right. For one, he placed an emphasis on the culture of the theater. Students and performers alike seem to respond to this. As a result, the Magnet Theater recently celebrated its seventh anniversary. A lot of what Diaz has applied to the theater came out of the training he received in Close’s class. In a mixer, improvisers with little to no experienced are paired up with more experienced improvisers to perform a two person scene, with both players benefiting from the experience. “You get so much better by playing with less experienced people and making them look good,” says Diaz. And Diaz is all about supporting his students. Over time the training center has grown to include more teachers. The only classes Diaz still teaches at the Magnet are sketch writing Level One and Two, and a class on how to teach improv. For now, Diaz continues to direct shows and coach improv teams at the theater. He hopes to develop a sketch writing program, and eventually, sketch teams that write and perform their own material.